I remember fence chargers from my youth. They interfered with radio and television signals. Has that been addressed in the newer versions? Yes I think modern fence chargers are much better at RF suppression at the charger. Fence chargers still require proper grounding, & watch for anything on the live wire that creates RF noise like vegetation or bad connections or insulators — that causes most interference problems. If you plug in the fence charger with the live wire disconnected & it still causes RF problems, then it’s the fence charger. Otherwise a good way to troubleshoot fence-generated RF noise is walk along the fence with a battery powered radio, & try the AM band which is typically more susceptible. For my project I used one continuous length of insulated fence wire from the charger to the bird feeder hanger & made sure to do a proper ground … no interference on radio or TV. I am thinking about using a timer that would turn the equipment on after dark and shut it off at daybreak. Comments? I was hoping to seek a little advice as I am having the same problem with racoons. 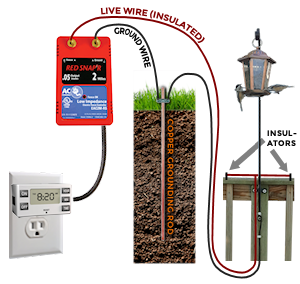 I purchased the same Zareba fence charger and simply connect the “live” feed wire to the metal round bird feeder pole and used a grounding post to connect the grounding wire from the Zareba system. I then insulated the live wire to the bird feeder and the bird feeder hangers to ensure that the birds would not receive a pulsed energy. I don’t have a way to test this as volt/ohm meters are set up to test higher amps and lower voltage. I called Zareba and they would not comment as they said this was not an approved use of their charger. Any comments/help would be appreciated. Hi John. If the bird feeder pole (live) is just stuck into dirt (ground), raccoons won’t receive a shock because electricity takes the path of lease resistance & a metal pole stuck into dirt means the circuit is already complete. The idea with fence chargers is live & ground should be insulated from each other, & the animal completes the circuit between live & ground. For a ground-mounted pole where you have the pole & feeder as live, you would need to create an insulating layer separating the pole from the ground, in some way so that raccoons make the only path between live/ground. For instance you could put the pole into a PVC pipe in the ground that’s capped at the bottom — PVC is an excellent insulator. Or you could switch the pole/feeder to be grounded, & instead run your live wire on plastic stakes around the base in such a way that raccoons are likely to touch both the wire (live) & the earth or pole (ground) but birds are not. Birds won’t receive a shock as long as you make it impossible for them to complete the circuit between live & ground. Sounds good – just keep in mind the wood post isn’t an insulator, & it’s also not a good conductor. To have the feeder/pole “live” & the wood post “ground”, the pole still needs an insulating layer separating it from the post. 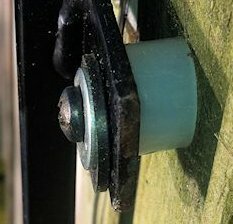 You could attach the pole to the post with U-bolts & have some rubber (like a cut-up bike tire tube) or PVC separating the pole from the wood & U-bolts. I don’t have the ground running to the pole presently. If I use PVC, where would you attach the ground wire to the pole above the PVC section; if not, wouldn’t the raccoon be isolated from ground…i.e., how would the circuit be completed? Sure, no problem – sounds like you are keeping the pole/feeder “live”? In that case the live wire would be attached to the metal pole, & the ground wire runs to your grounding rod … the earth becomes the ground (this is sounding very metaphysical!). Initially I was thinking the PVC would only extend a few inches above ground level, since its purpose is to keep the buried portion of the pole from direct contact with the soil. Thinking about it more, the concern there is snow if you want to run this year-round since raccoons are typically active in the winter. You’re right though — if you used a long section of PVC above ground, the raccoon wouldn’t be able to touch both the soil (ground) & the pole (live) at the same time. You’d have to run the ground wire up the PVC. That setup would be similar to how I ran the ground wire up onto the deck railing to help extend the ground circuit along the poorly-conducting wood. THANKS VERY MUCH for your response. Since I am in Florida, we deal with a 105-degree heat index, but not snow. I think this is both a blessing and a curse. I am going to pick up some PVC this morning. I should be able to run a test later today or tomorrow. Again, many thanks for the help and I will keep you posted. Could this be used with a remote? When a raccoon or non-native bird (house sparrow/starling) lights on the feeder, someone in the house could activate it? Sure, you’d plug the fence charger into a wireless outlet switch like this one. Wick, I have an all metal bird feeder about 2 feet tall. Would it be possible to connect the hot wire to the top of the feeder and connect a ground wire on the bottom and back to the grounding rod. Would this work or would it possibly damage the charging unit. Of course the feeder would be isolated from the metal post. 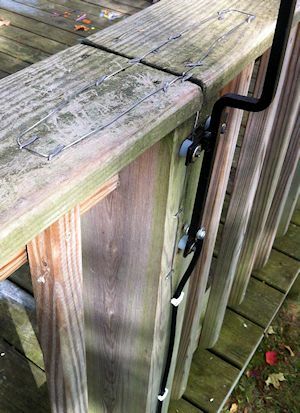 I really don’t want wires running all over my deck because of the grand children. Hi Hank, as long as the top part of the feeder (hot) is electrically isolated from the ground & any other parts that are grounded (like the post), that should work fine. When the feeder is just sitting there getting pulses from the charger, you want there to be no regular path from hot to ground. When the animal you’re trying to prevent comes along, you want to set it up so the animal has to touch both the hot & the grounded parts simultaneously, which gives them the shock. Hope that helps. Enjoyed reading the ideas for energizing the feeder pole. I have a metal feeder pole and here is my setup. I had no animal activity on my feeders for a couple of months and now the squirrels are back at it. I have split water pipe insulation around the pole. I have two insulated wires running to base of pole from charger, then two bare wires wrapped around the insulation separated about an inch apart and terminated separately at the top of the pole. I have to protect against jumping from trees or the roof sine I have a small yard. Shouldn’t this work? Hi Ed, I assume the two bare wires are hot & ground? That should work. Hi Brian, sounds like that would work. The squirrel touches both perches & would complete the circuit (receives the shock). Hey Wick set up a Patriot PE2 for small animal. Works great no more squirrels Thanks. 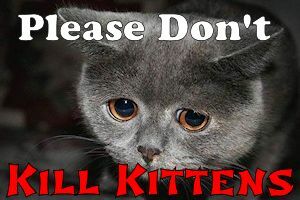 P.S no ground stake needed.